"Pureed shrimp dressing, served over garden fresh tomatoes makes a delicious light lunch. It is so simple to prepare, you will want to keep a can of shrimp in the cupboard to dress up a repast for unexpected company." Add shrimp, eggs, carrots, onion, salt, and pepper to the bowl of a food processor. Pulse until just combined. 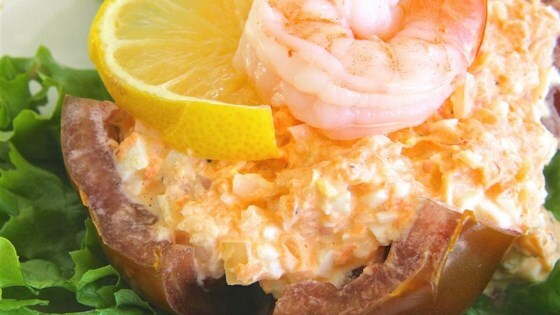 Blend mayonnaise with lemon juice and mustard; mix into shrimp mixture with a fork.